Idroenergy gas purifiers, with automatic nitrogen backwashing system regeneration, may be connected to Hydrogen and Nitrogen generators, when dew-point values to – 70 °C and purity better than 99.9995% are required (impurity content less than 5ppm). 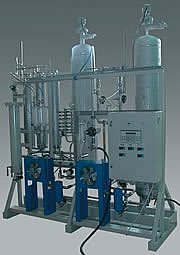 nitrogen and hydrogen mixing and regulation system, if required. 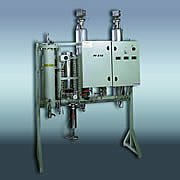 A safety mechanism interrupts gas flow if its quality exceeds tolerance limits. 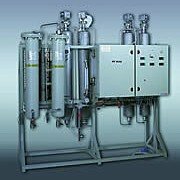 PF Purifiers are recommended where gas purity has great importance as in thermal treatments and all processes requiring high purity atmosphere, where oxygen content can be maximum 1 ppm. Full automatic operations controlled by PLC. The purifier doesn’t have any heating external resistance that may damage and corrode the metal. Idroenergy purifier has “plug in” internal heating resistance, equipped by special bottom flow diffuser. dozen of working years life). and the purifier occupancy area is reduced. 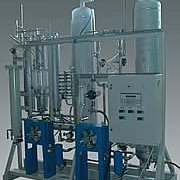 if required, mixing and regulation system of nitrogen and hydrogen, gases required for thermal treatment. Idroenergy more than 1500 customers and 3000 installer machines world wide - On site integrated sistem producing high purity gas for the most advanced insustrial applications. - Idroenergy is certified TUV.